vibrant, vermilion flame of awakening and purification. I am the heat, power, and vitality of creative essence. within the belly of your being. I am the flame of pure purpose galvanized within you! in lightning quickness or serpentine grace. of their own divine timing. I gently light the pathway of your natural unfoldment. in the divine dance with the Eternal Beloved. with which to make wings. Open to your enlivened passion! awaiting, like a silken lotus, to adorn you. These transformational insights are from The Mayan Oracle: Return Path to the Stars, by Ariel Spilsbury and Michael Bryner. Ariel has kindly given me permission to share them with you here. These poems are approximately 30 pages of a 313 page book and card set - In other words, the book is packed with insightful wisdom. 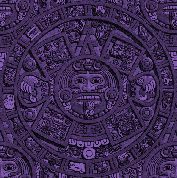 Expand your personal relationship with the Mayan archetypes; please visit them at their web site where you can obtain your own personal signed copy. In the book Ariel acknowledges Aurora (Cinda Seaton) for her contribution in these poetry sections. Thank you Ariel, Michael, Aurora and all others who contributed.